American Airlines flew supplies to Haiti on Wednesday but did not offer free flights to medical personnel, it says. (CNN) -- Twitter was buzzing Thursday morning with news that several airlines are flying doctors and nurses to Haiti free of charge to help with relief efforts there in the wake of Tuesday's devastating earthquake. The only problem: The rumors are false, an American Airlines spokesman says. "Last night's hoax on Twitter about American and JetBlue flying doctors and nurses to Haiti for free was just that -- a hoax. We don't know who is responsible, but it's a very low thing to do," airline spokesman Tim Smith said in e-mails sent Thursday. Twitter users also circulated a rumor that UPS would ship for free any package under 50 lbs. to Haiti. In a blog post Wednesday on UPS's Web site, a spokeswoman debunked the rumor and said that destruction of Haiti's roads and communications networks "means our own shipping services to Haiti are on hold." UPS is donating $1 million to help the people of Haiti through relief agencies, she said. On Wednesday, American and American Eagle sent three planes to Port-au-Prince, Haiti's capital, carrying 30,000 pounds of water, food and other nonperishable goods for its more than 100 employees who work at the airport there and for assistance at Port-au-Prince hospitals, the airline said in a news release. Three more relief flights are planned from Puerto Rico to Haiti on Thursday, and an additional three for Friday, the airline said. "We've incentivized our 62 million AAdvantage members to give cash to Red Cross and receive bonus miles from us," Smith added. "We cannot fly any passengers to Haiti at this time and our efforts on the humanitarian front are as described above." A spokeswoman for JetBlue said the airline is flying relief workers from agencies such as the American Red Cross free of charge to Santo Domingo in the neighboring Dominican Republic, but only after they have been vetted by the Haitian Consulate. The consulate then arranges transportation for passengers from Santo Domingo to Port-au-Prince, she said. "There have been a lot of people mobilizing on Twitter asking for our support. And I think that's where these rumors are coming from," JetBlue spokeswoman Alison Croyle said. "We're not offering free transportation for just any doctors who walk up and want to fly there." The American Airlines and JetBlue rumors erupted quickly on Twitter and other social networks, with people retweeting the Haitian Consulate's New York City phone number, which medical professionals could supposedly call for free flights. Calls overwhelmed the consulate, resulting in repeated busy signals for callers. But by late Thursday morning, word appeared to be spreading that the rumors were not true. Posted one user on Twitter about 10:30 a.m. 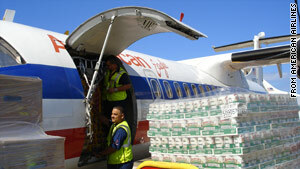 ET: "American Airline and Jet Blue Are NOT Flying doctors and nurses into Haiti for free. Do NOT call them."